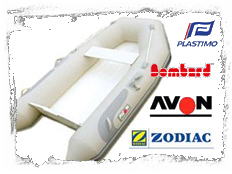 At Rib Shop we service and repair all leading brands of inflatable boats including repair to Avon, Zodiac, Bombard, XM, Narwhal, Yam, Wetline & Plastimo inflatable boats. Our experienced staff will ensure your inflatable is repaired to a high standard and will finish the job by carrying out a full pressure test to make sure the repairs have been successful. There is a minimum service fee of £75.00 including vat for any dinghy service or repair. We will inflate, pressure test and carry out any repairs that are covered in the minimum fee. You have the right to decline and take your dinghy away if the additional work is not acceptable. Our typical completion time from drop off is around 14 days. Once repairs are complete a full pressure test will be carried out prior to the boat being repacked. Due to current work load all dinghies repairs must be booked in advance. Please call on 01489 556800.